You can also access my Facebook page to see photo essays and posts from players and owners of my instruments. New updates to the See & Hear page. Waddy Wachtel Roberts BH-J45 presentation. Artist Endorser and Artists pages updated. New pages added for the Slope-shoulder dreadnought, The Modern, and the Buddy Holly J-45. I've been working with the Buddy Holly Foundation; here is some additional information. A new mini-documentary about me and my work is available here. The September 2011 issue of Guitar Player Magazine features an article on one of my Artist Endorsers, Kevin Kastning. The article is about the making of his latest release on Greydisc Records with British fusion guitar master Mark Wingfield, entitled I walked into the silver darkness. 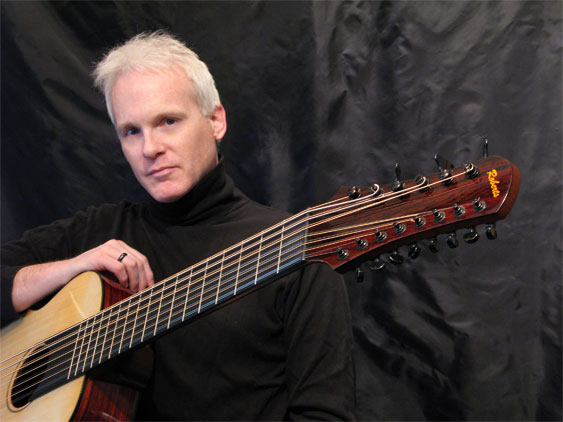 The Roberts 14-string Contraguitar is pictured in the article, and is Kevin's main instrument on the new album. You can see Kevin playing the Contraguitar during the recording sessions in the article's photo. Click here for a PDF of the article. As of September 1, 2011, I have moved into a new shop. The new Stringworks is almost triple the size of the old facility. New shop tour photos coming soon! Kevin Kastning recently completed recording sessions with Alex de Grassi for an upcoming duet album. Kevin used the Roberts 14-string Contraguitar as his primary instrument on the recording sessions. * The Holiday 2010 issue of Guitar Player Magazine included a feature article on one of my Artist Endorsers, Kevin Kastning. KEVIN KASTNING HAD JUST RECEIVED HIS NEW “CONTRA guitar”— a 14-string extended-range instrument co-designed and built by Dan Roberts, formerly of Santa Cruz Guitar Company, now of Daniel Roberts Stringworks— the day before our interview. The Contraguitar joins the Santa Cruz KK-Alto, DKK Extended Baritone, and DKK-12 12-String Extended Baritone guitars in Kastning’s pantheon of unique stringed instruments. Although Kastning studied classical and jazz composition formally—including taking private lessons from Pat Metheny while attending the Berklee College of Music—and is fluent in both traditions, the music he plays on these guitars is as singular as the instruments. Kastning’s latest release, Returning [Greydisc], represents his fourth collaboration with virtuoso Hungarian acoustic guitarist Sándor Szabó. As on the duo’s previous albums (Parabola, Parallel Crossings, and Resonance), the music is entirely improvised—though it nonetheless possesses such inherent compositional integrity that one might reasonably question the spontaneity of its origins. Szabó’s acoustic 12-string baritone guitar interweaves almost supernaturally with Kastning’s extended-range instruments to create a sort of impressionistic neoclassical folk music of such consistency and emotional depth that it would still be astonishing even if it had been painstakingly composed rather than manifesting mysteriously in the moment. Besides channeling The Source in real time with Szabó, Kastning has composed numerous piano sonatas, string quartets, and other classical works, as well as collaborating with acoustic guitar innovator Siegfried on several recordings, and contributing to 2008’s Unplugged & Unfretted: A Collection of the World's Acoustic Fretless Guitarists (he also plays fretless acoustic). Kastning is currently recording with legendary cellist David Darling, and a mostly improvised album with English electric jazz guitarist Mark Wingfield is in the offing for 2011. The music on your albums with Sándor Szabó is entirely improvised, yet most of it sounds composed. How is that possible? I will tell you as much as I know about the process. All of the albums were recorded in a single day. That’s how well we play together. On the first album, we brought little sketches that were a couple of bars long, but we abandoned that fairly quickly because we were thinking so much alike and our interaction felt really natural. For example, pieces would begin and end in unison. We might discuss some things ahead of time like, “I’m going to begin this piece in 5/4, give me two bars up front,” or “You start in that register and I’ll start in this register”—but that’s about it. And on some pieces one of us would just begin playing without any discussion at all, and we would go from there. A lot of people say they’re surprised when they find out that those are all improvised pieces. I don’t think of it so much as improvisation as I do real-time composition. You pick up a score of music and there was a time when that was improvisation. Written music is really just frozen improvisation. When I’m playing solo pieces, I’m thinking about the form. But when I’m working with Sándor, I’m just listening to him and getting a sense of where the composition is going. After that, I just stay out of the way and let the music go where it wants to go. I’m not thinking about scales or harmonic structures, I’m not thinking about transitional moments or sections in the piece— I’m just sensing the piece as a whole, letting it go where it wants to go, and giving it all the space and nurturing it needs to do that. You speak of the music almost as if it was an entity. How do you conceptualize the source of creativity? I feel that music comes from somewhere else. I don’t pretend to create it. I just allow it to come through. A lot of times I’ll listen back to a recording and there will be a tremendous amount of stuff that I don’t remember playing or even recognize as me. It sounds like a very spiritual thing to some people, and maybe it is, but I think it’s something that’s not really of this physical plane. That source could be God, or something so deep within the artist that they’re not even aware of it, or it could be nature. And it is also partly the chemistry between two or more people. It’s a big question, and I’m not that smart of a guy [laughs]. Talk a little bit about your primary instruments and tunings. Nothing that I’m doing now involves a 6-string guitar in standard tuning. I do a lot of practicing on classical guitar, but I don’t record with one, and I do most of my composing on piano. I have three main instruments, and a fourth arrived yesterday. The first three are the Kevin Kastning series instruments that I developed with Santa Cruz, specifically with Dan Roberts when he was there. Dan and [Santa Cruz Guitar Company founder] Richard Hoover really made these things happen for me. The DKK Extended Baritone has a 28.5"-scale and is tuned to F#, in other words a whole step above a bass, though for the Retuning album it was tuned to E. The instrument I consider my main guitar is the DKK-12 12-String Extended Baritone, which is a 12-string version of the same instrument, also tuned to F# . Most baritone guitars are maybe one or two whole steps below concert pitch, but these are a full 7th below. The third guitar is the KK-Alto, which is another 12-string instrument that’s tuned to A, a fourth above standard tuning. The fourth instrument is the Contraguitar? Yes. I wanted an instrument that could go down to E without being a bass, and also go well into the alto range on the top—that sort of upper cello register sound. I also wanted to have more than six courses of strings, and the final instrument has seven, for a total of 14 strings. Dan and I worked out the details over a tremendously long time, so that by the time we had nailed down what it was going to be, he had started his own company, Daniel Roberts String Works. The Contraguitar has a 30" scale length and the nut is 3.25" wide. Right now I have it set up in octave tuning from E to A. I’ll start using some of my personal tunings with it once I get acclimated to playing it. The voicing and textures are orchestral in scope. Recently I’ve been playing almost entirely with my fingers, using what is essentially classical technique, which partly came out of frustration with the pick. First of all there’s something between you and the string. Also, when you play a chord on a piano, you’re hearing all the notes at once, and on the guitar you don’t always, because you tend to strum bass to treble across the strings. That has always bothered me. With my fingers, if I’m playing a four-note chord voicing I can grab all four notes at once and it sounds like a complete harmonic structure. Also, a lot of my lines are angular, with leaps of an octave or more inside of a line or a phrase. While I can do that with a pick, it happens much more instantaneously and cleanly with my fingers. When I do play with a pick, my technique tends to confound other guitarists—and I don’t necessarily mean that in a good way [laughs]. I hold the pick backwards using the rounded edge, and at a 45-degree angle rather than parallel to the strings, so I’m not picking with a direct attack. Also, I hold the pick between my thumb and first two fingers, and I just brush the strings instead of pounding the sound out, which makes it tend to sound more like fingers than a pick anyway. Is your left-hand technique also rooted in classical playing? While I was in high school I would watch cello players. Cellists keep their thumb in the middle of the back of the neck at all times, which provides tremendous reach with their fingers, and opens up a whole world of chord voicings that wouldn’t be possible otherwise. Of course, the technique is common with classical guitarists, but I didn’t know that at the time. That approach doesn’t work with the Contaguitar, however, as the neck is so wide (nut width = 3.25 inches) that I wind up placing my thumb more under the treble strings than in the middle, and to reach the bass strings it comes out from behind the neck entirely, at which point I use it more like an additional finger. What are the most important things you took away from studying with Pat Metheny? The first had to do with my time. I had already been playing professionally when I began studying with Pat, and nobody had ever suggested that I needed to work on my time. But in a very genuine way he told me my time was inexcusable, which really got me thinking about time and rhythm in ways that I never had, and that had a tremendous impact on me. The second really good thing was more spiritual and emotional. It was early in my first semester, and I was depressed because I felt like all of the teachers and students were these killer musicians, and I was just kind of hiding behind the furniture wondering when I was going to be found out. Pat must have picked up on it because at the end of the first lesson he said, “You probably hear a lot of guys with great chops at Berklee, but I want you to completely ignore them, because they’re not your competition. I’m your competition. You just worry about me.” I felt a lot better after that, because rather than comparing myself to others I could focus on what really mattered.